Published 1899 by the Manistee Daily News. The nucleus of the First Congregational Church of Manistee was gathered by the preaching of Rev. Geo. THOMPSON, a missionary returned from the west coast of Africa. The place of meeting was for several years in an old school house, now destroyed, in which, on the 20th of July, 1862, the church was organized with ten members. In October, 1862, Rev. J. M. McLAIN became pastor for one year, with L. S. ELLIS, first deacon. He was followed by Rev. O. A. THOMAS, who labored with the church about two years. In November, 1866, Rev. Herman GEER began a pastorate of somewhat less than one year. During the autumn of the same year the church occupied a building erected for its use near the corner of First and Spruce streets. In November, 1867, Rev. John B. FISKE became pastor of the church, continuing in that relation until May, 1872. A church edifice was built and occupied during 1868, the church occupying for several months a temporary building near the site of the church. Mr. FISKE was succeeded by the Rev. J. F. GAYLORD in April, 1873, who labored with the church until July, 1878. Rev. E. G. CHADDOCK was called by the church and entered upon the pastorate in October, 1878. He closed his labors in May, 1881. Rev. Theo C. JEROME commenced his labors in July, 1881, and remained pastor of the church for one year. Rev. Edmund B. FAIRFIELD entered upon his pastorate September 1, 1882. He resigned April, 1889 having begun the work of erecting the new church. Rev. C. M. WESTLAKE succeeded and remained two years. Rev. Andrew M. BRODIE, the present incumbent, entered on his labors December 1st, 1891. The old church soon proved too small and steps were taken to complete the present house of worship, which is one of the best equipped in the state. It was dedicated free of debt December 11, 1892. The total cost was $60,000. REV. ANDREW M. BRODIE, D. D.
Andrew M. BRODIE was born of Scotch parents, at Aurora, Canada, August 12th, 1859. He pursued his literary studies at Newmarket High School and Guelph Collegiate Institute. He taught school for four years and after a short business career went to Chicago Theological Seminary, from which he graduated with honors, receiving the degree of B. D. in 1888. He was at once chosen pastor of Columbia Congregational church in Cincinatti, O., and after four years of most successful work, was called to the pastorate of the First Church of Manistee, in December, 1891, Olivet College conferred upon him the degree of D. D. in 1896. Vine Street Church, better known as Maxwell Town Mission, like Filer Town Church, grew out of mission work among the children. The building was erected during the labors of the first and only pastor, Rev. SILLENS. This work was coupled with that of Filer Town until the removal of the pastor. Since that time only occasional preaching services have been held, though a regular Sunday school has been maintained by the First church. The enrollment is 125. Mr. A. B. SEARS is the superintendent. The Filer Town Congregational Church was the outgrowth of a Sunday School work around the lake, largely planned by Mr. and Mrs. WALKER of the First Church. A church and society were organized and incorporated Sept. 10th, 1883, with Rev. SILLENS as pastor and Calvin S. DAVIS, John McFADGEN and Matthew MULLEN as trustees. The church has had in all seven pastors:Revs. SILLENS, BOSWELL, GLEASON, HARROWER, McCLEMENS, EVANS and SHARP, each serving a short period. At present no regular service except Sunday school is conducted. 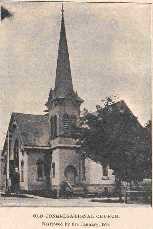 The First Methodist Episcopal Church in Manistee was organized by Rev. N. M. STEELE in 1860, and was composed of five members. There had been regular preaching services for two years previous to this time but there were not enough members to form a class. Mr. STEELE was succeeded in 1861 by Rev. A. A. DARLING, who conducted the first revival ever held in this city. 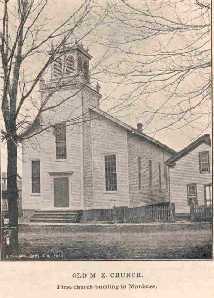 In 1862 the first church building erected in Manistee was commenced under the pastorate of Rev. H. H. BEMENT, on a lot given to the society by Mr. John CANFIELD on First street. On the completion of the church the Sunday school was organized with H. N. GREEN as superintendent. A succession of pastors followed with varying success. In 1881 Rev. George L. HAIGHT was appointed pastor. When he arrived he found no house to move into and no church to preach in, the old church having been sold by the society to meet obligations against it. With characteristic energy he rallied the somewhat discouraged membership, and the trustees decided to purchase the present parsonage and the adjoining lot for a church site. The purchase price was $2,800, of which they had in hand $600 from the sale of the old church. They then proceeded to erect the present commodious church edifice, and in less than three years the church had acquired property worth $12,000. From that time onward the Methodist church has been a prosperous institution; its pulpit has been occupied by men of marked ability and character, and its membership has increased to about three hundred. The Sunday school, organized in 1862 has been very fortunate in its management. It has had but one change in superintendents in twenty-four years. In 1875 James H. LYONS was elected to that office and held it with efficiency until his removal from the city in 1890, when the present superintendent, J. H. GRANT was elected. Under Mr. GRANT's management the school has been graded, some normal work has been done, and the best available helps for teachers supplied. A new library is the latest addition to the equipment of the school. The young people of the church organized for religious improvement and effort in 1884, and after some changes the society took the name of the Epworth League. The Epworth League has about 100 members and is a very efficient agency in the religious culture and benevolent work of the church. In addition to these agencies the ladies are organized into a Woman's Foreign Missionary society, a Woman's Home Mission Society and a Ladie's Aid society, all of which are actively at work in their respective spheres. Junior and Intermediate Epworth Leagues are supplementing the work of the Sunday school in training young workers for the church. Methodism is firmly established in Manistee, and the outlook for the future of the church is very bright. Rev. T. A. FERGUSON, the present occupant of the pulpit of First church, is a thoroughly cultured gentleman, and is every way qualified to administer the large interests of the church. St. Mary's congregation was formally composed of all the Catholics of Manistee, but in the course of time the Poles, and the Irish and Germans organized separate congregations. The first missionary who visited Manistee was undoubtedly Pere Marquette, who, with Joliet, discovered the Mississippi. After Marquette the French missionaries, under the jurisdiction of the Bishop of Quebec, continued to visit at long intervals, the country then called "the region of the great lakes." The headquarters of these missionaries were, and are yet, at Sault St. Marie. These missionaries, like Father Marquette, were members of the Society of Jesus, commonly called Jesuits. The last Jesuit missionary who visited Manistee before the first resident pastor of St. Mary's church was appointed, was Father SALUMIERE, of St. Gall's church, Milwaukee. The first St. Mary's church was a little frame building on the north side of the river, on the block now occupied by the Thorpe hotel, and the first resident pastor was Rev. Henry H. MEUFFLES. Father MEUFFLES remained in Manistee from 1868 till June, 1873. His successor was Rev. Marianns WILLIGAN, who built the present St. Mary's church with the pastoral residence and the teachers' house. In September, 1881, Rev. D. CALLERT succeeded Father WILLIGAN. In 1883 the Poles, who were in large numbers in the congregation were allowed to separate and organized the present St. Joseph's church. The church again became too small to accommodate the large congregation and in January, 1888, the Irish and German Catholics were granted permission to organize the Guardian Angels' church. Father CALLERT became the pastor of the new church, and Rev. J. T. HUDON was appointed to the pastorate of St. Mary's. St. Mary's congregation is now composed of about two hundred families. Branches of several different Catholic benevolent associations have been organized by the parishioners, and, like the congregation they are in flourishing condition. The church of the Guardian Angels traces its origin to the very earliest settlement of the white man in the vicinity. Even previous to the foundation of a colony here the place is said to have been visited by Father Marquette and other Catholic missionaries, whose object was the spiritual welfare of the Indians who inhabited these shores. In August of 1868 Bishop BORGESS sent Father H. MEUFFLES as resident pastor of Manistee and missions. He was succeeded in 1873 by Father M. WILLIGAN, under whose leadership the present St. Mary's Church building was erected. In September, 1881, Rev. Father CALLERT was appointed to succeed Father WILLIGAN. The Catholic congregation had now grown to such proportions that St. Mary's church could not accommodate all that came to worship, and a separation of the Polish people was granted by Bishop RICHTER. Again after a few years the St. Mary's congregation had outgrown the capacity of the church, and after repeated urgent requests another separation was granted, and on Tuesday, January 24, 1888, the papers formally dividing the congregation were signed by the committees appointed for the purpose. On May 1, 1888, Rev. Father H. W. GRIMME, of Big Rapids, Mich., took charge of the new congregation, and steps were immediately taken to erect a church edifice. A lot on Fifth street, at the end of Sycamore, was purchased at a cost of $3,000. The corner stone of the new building was laid on September 2, 1890, and on December 21, 1890, Rt. Rev. Bishop H. J. RICHTER, of Grand Rapids, blessed the church under the name and the protection of the Guardian Angels. Under the zealous and efficient management of Father GRIMME the Guardian Angels church prospered, but a sad loss was in store, for the new congregation, for on the eve of Thanksgiving Day, November 25, 1891, Father GRIMME, who had been stricken with typhoid fever, passed away at Mercy Hospital, leaving a host of friends and a bereaved people, to whom he had so lovingly and faithfully ministered, to mourn his loss. After the death of Father GRIMME, Rev. J. T. HUDSON attended the church of the Guardian Angels' until the appointment of the present pastor, Rev. J. M. STEFFES, on September 1, 1892. Since the coming of Father STEFFES important additions and improvements have been made to the church property. Two new altars and the beautiful statuary which adorns the interior of the edifice have been purchased, and the present commodious school building erected. The value of the property belonging to the Guardian Angels' church is estimated at $63,000. The present membership of the church consists of two hundred families, or about eight hundred souls. The Catholic Mutual Benefit Association is one of the leading societies of the congregation. It was organized in 1889 by Father GRIMME, and has a membership of 80. The Ancient Order of Hibernians, organized March 13, 1898, has a membership of 50. The Catholic Knights and Ladies of America, an insurance society connected with the church, is in a flourishing condition, as is also the Ladie's Auxiliary. conducted in connection with the parochial school of St. Mary's church. When the congregation removed to the present church the chapel was set aside for school purposes and two school rooms, with an attendance of eighty children, were conducted under the direction of the Sisters of Mercy. In the fall of 1893 the present commodious school building was completed at a cost of $10,000. In January, 1894, four school rooms were opened in the new building and assigned to the teaching of the lower grades. The Sisters of Mercy have continued to administer the interests of the schools with characteristic ability, and the attendance has grown to 172. Father STEFFES, although a young man, has shown evidence of rare ability and tact in the administration of the affairs of his large congregation and by his kindly and sympathetic devotion to his pastoral duties has endeared himself to the people of his parish. In the community at large Father STEFFES is recognized as a man of rare scholarship and liberal views, and a friend to all movements which make for the common good. St. Joseph's Polish Catholic church is one of the largest congregations in the state of Michigan. An outgrowth of St. Mary's Catholic church of this city, the early history of St. Joseph's is indissolubly connected with the growth of the older congregation, a history of which will be found on the preceding pages. In 1864 the congregation of St. Mary's had become so large that the church could not accommodate the members - a majority of whom were Polish people. Consequently, a separation of the Polish communicants was granted and three thousand dollars having been pledged the new congregation began the erection of a church under the direction of Father CALLERT, pastor of St. Mary's. On May 14th, 1885, Father W. GROCHOWSKI was formally installed as pastor, and on June 14th, following, a committee consisting of Valentine PURGIEL, Felix KUKLA, Matthew SIELSKI and Stanislaus CICHY was appointed as lay members to oversee the affairs of the new church. The church building was completed the same year and also the first school building and the sister's home at a cost of $2,500 and $1,500 respectively. In 1886 the parish house was erected at a cost of $4,500, and has since received improvements at an added cost of $2,000. In 1887 the two towers on the church were finished at an expense of $4,500 and the same year seats were replaced in the building at a cost of $1,500. At the date of its organization some three hundred and fifty families were included in the membership of St. Joseph's church, but the society grew rapidly, and on May 19, 1880, Rev. Edward KOZLOWSKI, the present pastor, was sent to administer its affairs. Since that time the congregation has made marked and substantial progress, and Father KOSLOWSKI now requires the services of an assistant to supplement his efforts. 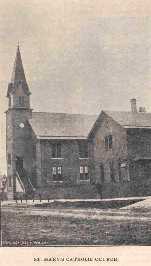 The old school building proved too small to accommodate the large number of children in the congregation and in 1889 an addition was built on at a cost of $2,500. A pipe organ was added to the equipment of the church the following year, at a cost of $2,400. In 1891, the church house was furnished, a steam plant installed, and $1,500 spent upon the introduction of a sewerage system throughout the church property. In 1892 the church bells were bought at a cost of $3,000 and in 1893 the belfry adjoining the church was erected and a tower clock installed at a cost of $2,000. A steam plant costing $1,350 was added to the school in 1895. On November 2, 1897, the school building was destroyed by fire, but steps were soon taken looking to the erection of of a larger and more modern structure and on July 7, 1898, at 3:45 o'clock in the afternoon, the first stone of the new foundation was laid by Father Kozlowski. The building is red brick 134 by 87 feet and is trimmed with buff Bedford stone. When completed the building will be a model of modern school architecture and fully equipped to meet the most advanced requirements. The basement will be devoted entirely to the entertainment of the pupils and young people of the parish. There will be two club rooms and a room for the meetings of the various societies connected with the church. A billiard and a reading room are among the features provided by the designers. These, together with a spacious gymnasium, occupy the west wing of the basement. Five large class rooms, separated from each other and from the main hall by walls of solid brick take up the space afforded by the first floor. These rooms are 32x36 feet in dimensions with 13 foot ceilings and are lighted by large windows covering one entire side of the room. The library and office of the principal will occupy the space over the main stairway on the first floor. On the second floor are six large class rooms, lighted and finished in the same manner and style as the rooms on the first floor below. A feature of the building which is unique, and which reveals the forethought of the designers is the large auditorium which will occupy the entire third floor of the building. This hall will be fitted with a stage 40x50 feet in dimensions and will have seating capacity for one thousand people. The hall will be used by the dramatic club and by the larger societies of the congregation. A slate roof, surmounted by a tower, will add to the architectural beauty of the building, which will be one of the most complete and handsome of the many public buildings of the city. Over $16,000 has already been spent upon the structure and when completed the school building will have cost St. Joseph's parish $35,000. The building will be opened in September of this year when it is expected that five class rooms and the office will have been completed. The growth of St. Joseph's school has been decidedly rapid. In 1887 four teachers were employed. In 1890 six, in 1892 seven, and in 1893 eight teachers were required. 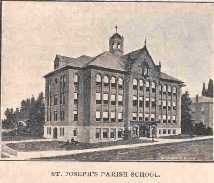 In 1893 a branch of St. Joseph's school was established at East Lake and was maintained until 1898. The total value of the property owned by St. Joseph's congregation is estimated at $80,000. This includes the church building, school, pastor's residence and sisters' house. It is not definitely known when the first services of the Anglican Church were held in Manistee, but old residents tell of services being held in the very early days of the city. In 1872 Rev. Joseph B. PRITCHARD, the pioneer missionary of the church on this shore of Lake Michigan, visited Manistee and finding a number of church people here, reported the fact to the Bishop, and Manistee was added to his jurisdiction on May 26th of that year. The first organization was perfected on June 20, 1876. It was under the charge of Father PRITCHARD, who made regular visits to the city for week-day services until Dec.18th, 1881, when Rev. William S. HAYWARD was appointed missionary at Manistee and became the first resident priest of the church in this city.He remained until October 26, 1886. For about a year the mission was under the care of the general missionary of the Diocese, but during the months of July and August, 1887, services were conducted by Rev. F. S. MALTOS, then the rector of a church in Florida, and who was spending his summer vacation in Manistee. A call was then extended to the Rev. H.E.S. SOMERVILLE, who took charge of the mission in October, 1887. The services of the church were held in private houses, and occasionally in other churches and in public halls. In 1887 a room was leased in the Engelmann block and fitted up for use as a chapel, and was so used until december, 1888. In the spring of that year arrangements were made for building a church. St. Paul's mission was disbanded and the present parish organized. A lot at the corner of Fourth and Sycamore Street, owned by the parish, was sold and the proceeds turned over to the parish. 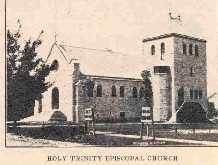 The church lot on Second street was then purchased and the stone church of the parish was built, the first service being held therein on december 16, 1888. The rectory was built in the summer of 1890. The cost of the church and its furniture and the rectory, including the lot was over $9,000. In the spring of 1891 Father SOMERVILLE resigned and Rev. Thomas HINES was called, and was the rector of the parish until January, 1898, when he resigned. Rev. John SWORD, the present rector, has been in charge one year and is very highly esteemed by members of the parish. The parish numbers about two hundred members, is known as a "high church" parish, and probably has the most Catholic services to be found in the Anglican church in Michigan. The German Evangelical Lutheran congregation is one of the oldest in Manistee. A certain Rev. SCHMIDT, at that time missionary of the denomination on the western shore of Michigan was the first German Lutheran minister to preach in Manistee. This was in 1867-68. The Reverend's KARRER and TOERVE, successors of Rev. SCHMIDT, also made a number of visits to this city. In 1869 the Rev. F.W. DENKE was stationed here and the same year organized the present Trinity Church. The church building occupied by the congregation was built in 1870, and dedicated on September 18th. In 1872 Rev. DENKE resigned and Rev. Hermann LEMKE, the present pastor, was called. The church is one of the largest of the denomination in the state and comprises 335 families, of which number 975 are communicants. There are 116 voting members. In connection with the church there is a parochial German-English day school. The first school house was built in 1872 and Mr. R. TREIBER was the first teacher. His successor was Mr. August HAISE. In 1876 Mr. L.F. BRINKMAN took charge of the school and under his able management the attendance increased so much that in 1878 it was necessary to erect another school room. Another teacher was called in the person of Mr. H.H. HENSICK. 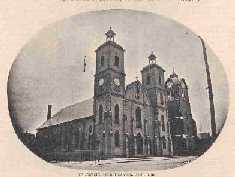 In 1883 it was necessary to further enlarge the building and the church then built the present structure facing on First street. It was completed in 1884. Mr. H.F. MERTENS was added to the list of teachers. All three teachers are graduates of the teachers seminary of the Synod. The present enrollment of the school is 225. The first Dane arrived in Manistee in 1860.Others followed and soon there was quite a colony. They united with the Norwegians and Swedes and a church was formed. 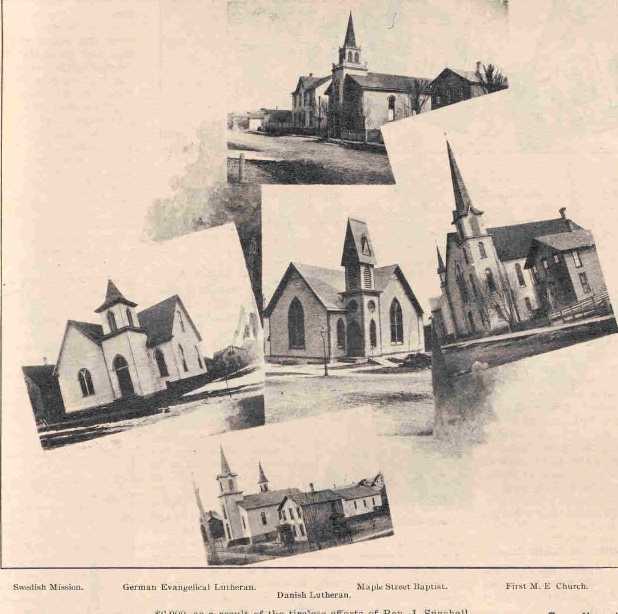 A lot was purchased and a building erected.On May 30, 1869, the first meeting in the new church was held despite the fact that it was without seats and was unplastered. Differences arose among the three nationalities represented, and a separation followed, the Danes retaining the church property. The Danish church in Denmark was appealed to and soon a pastor, Rev. Holger ROSENSTAND was sent to take charge of the congregation. He arrived on November 30, 1873. During his pastorate the present parsonage was built. He was succeeded by Rev. F.M. CHRISTENSEN, who served the church for two years. Rev. J.F. LILLESO was the next pastor, and under his leadership a parochial school was established. In 1883 Rev. J. HANSEN arrived from Denmark to assume the pastorate. He died in 1888, and was followed by Rev. P. YOTKE, who remained with the congregation for six years. Rev. K.C. BODHOLDT, the present pastor, was called in 1895 from Omaha, Neb. Under his charge the membership of the church has grown and the society materially strengthened. The church has recently been re-decorated, and furnished in a manner creditable to the worshippers. Rev. K.C. BODHOLDT was born Feb. 9th, 1865, in Christianasfeldt, Norway, and came to America in 1876. He returned to denmark to complete his theological studies, and was ordained in 1881. He was then called to the pastorate of the Central, Nebraska, church, and afterward to Omaha, where he remained eight years. He came to the Danish church in Manistee in 1895, and has served the congregation acceptably ever since.Rev. BODHOLDT is a member of the examination board of the general Synod of the Danish church in America, and has held the office of editor of the church paper for three years. He has also been president and secretary of the Synod. The Maple Street Baptist church edifice is a neat little brick structure situated at the corner of Maple and Third streets. It was erected in the year 1882 at a cost of about $6,000, as a result of the tireless efforts of Rev. J. SNASHALL, who served the church as pastor for several years. He was succeeded by professor BRAYTON, Leroy H. WHITE, and a number of other temporary pastors. At present the pulpit is filled by Rev. J.D. FREY. The membership of the church is about seventy-five. It has a prosperous Sunday school with membership of one hundred, and also a flourishing Baptist Young People's Union. The Ladies' Aid Society and all branches of the church work are in good condition. In addition to the regular church organizations several special committees have recently been appointed. They are: A reception committee, a home mission committee and a visiting committee. The results of the labors of these committees has proved very satisfactory. The congregation is entirely free from debit, and in a very prosperous condition. Rev. J.D. FREY came to the church in August, 1898, from Holland, Michigan. He is a graduate of the Hillsdale college and theological school. This society was organized on the 22nd of April, 1882, with nine members. Articles of incorporation were taken out July 19, 1883. The early period of the history of the church was one of trying struggle and perseverance. The congregation, having no place of meeting, was obliged to resort to the homes of the members for prayer and bible reading. In the spring of 1884 a lot was purchased, and the following year a building erected at a cost of $1,900. In 1896, the church, which was situated on McKee Street, was rebuilt, and now represents a value of about $2,500. The first pastor was Rev. HOGBERGH, and his successor Rev. LUNDQUIST who served for two years. He was followed by Rev. J.W. CARLSON, who served as pastor for seven years. Under his leadership the membership increased from 30 to 104 members. The present pastor, Rev. Carl SANDSTROM, came to Manistee in January, 1897. He was born in Wastergotland, Sweden, September 30, 1872, and came to America the spring of 1892. He graduated from Covenant's College, North Park, Chicago, in 1896, and his first charge was at Trout Creek, Mich. There are 151 members in the congregation and 110 in the Sunday school. The young people's society has a membership of 36. Mr. Emil JOHNSON is superintendent of the Sunday school. The beginning of the Swedish Lutheran church dates from the year 1884, when the Rev. V. VIXELL, of the Illinois conference came to Manistee and conducted a series of revival services and cottage prayer meetings. As a result of his labors an organization of the Swedish Lutheran church was effected, and in 1885 the church was formally established. The church edifice is located on the corner of Cypress and Magill streets. Rev. VIXALL was chosen as the first pastor and served the congregation for several years. He was followed by Rev. J. FORSBERG, the present pastor, who has ministered to the flock for the past ten years. 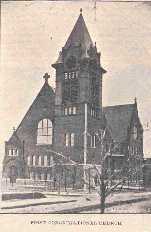 The membership increased and in 1889 the church was rebuilt, making the church one of the most substantial owned by the denomination in the state of Michigan. The membership of the church at the present time is 573. The Sunday school is very prosperous, and conducts a branch school at East Lake. Among the societies within the congregation are the Sick Fund society, a ladies' Aid society and a Young People's society. The Dolkas society is also a very prominent factor in the work of the church, making a special feature of providing clothing for the poor of the city. Rev. J. FORSBERG, the pastor, was born in Sweden and came to America in 1836. He is a graduate of the college at Rock Island, Ill. After completing his course he acted as state missionary in Chicago for several years. He served the congregation at Rock Island in 1871, and was called to Aurora, Ill., in 1872. In 1873 he returned to the missionary work in Chicago, and in 1877 preached at Tustin, Mich. In 1878 he was called to his present charge in this city. This organization owes its existence to the large number of Scandinavian Methodists who emigrated to Manistee. The church is connected with the Methodist Church proper, the only distinction being that the services are conducted in the Scandinavian tongue. The first Scandinavian Methodists to arrive were E. NORDROW, his wife and son. Upon their invitation, rev. A.R. 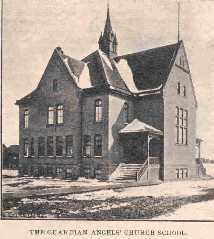 GUSTAVSON visited Manistee and held services in the old Maxwelltown school house in August, 1878. A class of five persons was also organized at that time. This class was temporarily connected with the English congregation. At the following annual conference Rev. A.R. GUSTAVSON was appointed minister to the new church. On Christmas day, 1878, a chapel costing $1,500 was opened for the first time to receive the new congregation. Rev. GUSTAVSON served the church two years and was succeeded by Rev. H. DANIELSEN, who remained three years. The church flourished and succeeding pastors were: Rev. E. ARVESEN, Rev. B. SMITH, Rev. E. ENDRESEN and Rev. A. HANSEN. During the latter's administration a new church was built and dedicated. Rev. C.H. MUNSON was the next pastor. The present pastor is Rev. Paul HAUGEN, a graduate of the Northwestern University Theological school. The church has a membership of 95 in full connection, and a Sunday school with 70 members. St. Paul's Evangelical Lutheran church was organized in 1881, and at once purchased the old Methodist church building on First street. This building was used for a place of worship for a number of years, but it became apparent that the location was not favorable for the growth of the society, and in 1890 two lots on the corner of Fourth and McKee streets were purchased and a suitable building erected. The old church was torn down and the material used to construct the present school building occupied by the church. In 1898 another building was added to the two already erected, and shortly afterwards a fine church parsonage was built. At present the congregation numbers about 120 families. The organization is in a very flourishing condition under the able direction and ministration of the pastor, Rev. A. MOUSSA. In 1885, Rev. A. MOUSSA, pastor of St. Paul's Evangelical Lutheran Church, began the organization of a parochial school, and shortly after the school was opened in a rear addition of the old church building on First street, with nine pupils in attendance. The number of pupils gradually increased and in 1898 the average attendance was 38. In this year a teacher was employed for the first time, the instruction having been carried on by the pastor. In 1893 there were 70 pupils enrolled and Mr. H. BRAUN was employed as teacher. The school was removed to its present quarters in 1893, and is now attended by about sixty children of St. Paul's congregation. The German Evangelical congregation was established in 1898, but its real beginning dates from the previous year. 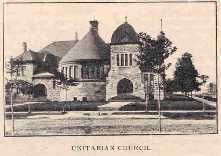 Owing to a disagreement on the subject of secret societies, a number of the members of the St. Paul's Lutheran church withdrew from that organization and formed the St. Petri congregation. Others joined the new society and in June, 1898, a pastor was called. The first services were held in the Congregational church on Vine street, but soon the young church decided that it needed a house of its own and work on the new building was begun in September of the same year. On December 11, 1898, the building was dedicated, and the congregation comfortably housed. The building is 72 by 36 feet in dimension. The congregation is associated with the Evangelical Synod of Michigan and other western states. Among the supplies furnished the church by the Synod after its organization were: Praeses BOEHNER, Professor MERZ, Rev. ZINK, Rev. ECKERT, Rev, MAIER and Rev. LINSENMAN, director of the church seminary. Since the organization of the church the membership has doubled. A parochial school is conducted by the pastor, and the common branches are taught in both German and English. The present pastor of the church is Rev. Otto SITZLER. 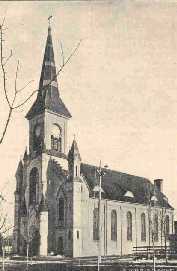 The Norwegian Lutheran church was organized in 1874. 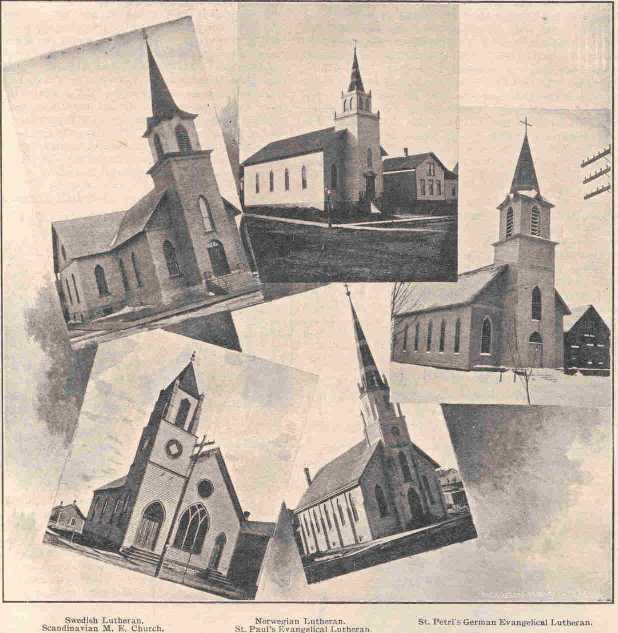 Up to this date both the Norwegians and Swedes had been connected with the Danish Lutheran church, but this year they severed their connection and organized a new congregation under the name of the First Scandinavian Lutheran church. For a number of years they worshipped together until the Swedes organized the Swedish Lutheran church. The Norwegian congregation now numbers fifty families, and owns the church and parsonage on the corner of Cypress and Fourth streets. The church is free from debit. Services are conducted in the Norwegian language. One Sunday each month the pastor conducts a preaching service in Brownton, where a small congregation is assembled. A prosperous Sunday school with an average attendance of 100 children and 12 teachers is an important feature of the church work. A men's society, ladie's society and a ladie's sewing circle are among the agencies at work in the congregation. The pastors of the church have been: Rev. T.H. WALD, Rev. R. BULL, Rev. Ole AMUNDSON, and Rev. O.H. STENSON, the present pastor. Rev. O.H. STENSON is a native of Norway, and was born near Bergen, September 3, 1854. In May of 1874 he came to this country and two years later entered the Augsburg Seminary at Minneapolis, Minn., one of the leading schools of the denomination. Here he completed his collegiate course and also graduated from the theological department. He was ordained at Minneapolis September 11, 1884, and immediately entered upon the work of the ministry at La Crosse, Wis., where he remained four years. His connection with the Norwegian Lutheran church of this city dates from 1888. The First Unitarian Church society occupies one of the most beautiful church edifices in the city. It is situated on the corner of Pine and Fifth streets in the center of the best resident portion of manistee. The first services of the Unitarian society were held in the old W.C.T.U. hall (now occupied by the Olympian club), in 1884-85. The first pastor was Rev. A.J. THOMPSON. He was followed in 1885 by Rev. Ira M. BILLMAN, who officiated as pastor for nine months. Rev. Albert WAKLEY was the next pastor, and during his pastorate services were held in the Englemann block. During the first year of his pastorate the plan to erect a church building for the use of the society was inaugurated, and the present beautiful edifice occupied by the congregation on the corner of Pine and First streets was soon after completed at a total cost of $13,466.30. In 1888, Rev. Albert WAKLEY resigned the pastorate, and Rev. Allen GOULD was called to the vacant pulpit. He continued to serve the church until 1891 when he also resigned to enter another field. The pulpit was vacant until 1895 when Rev. B.P. BYRNES was called and remained until 1897, when he left to take charge of the church at Genessee, Ill.